Feliceantonio Giusti first appears in the Painesville, Ohio, area in 1902. Felicantonio lived in Painesville from 1902 until his death in 1957. In America, Feliceantonio Giusti was known as Felix Anthony Juist. Feliceantonio Giusti, son of Domenico Giusti and Emerenziana Scacciavillano, was born on April 26, 1878, at Frosolone, Italy. He married Armonia Lombardi, daughter of Donato Antonio Lombardi and Maria Giuseppa Battista, on January 7, 1909 at Painesville, Lake County, Ohio. Feliceantonio died on May 21, 1957 at Lake County Memorial Hospital at Painesville, Lake County, Ohio, at age 79. 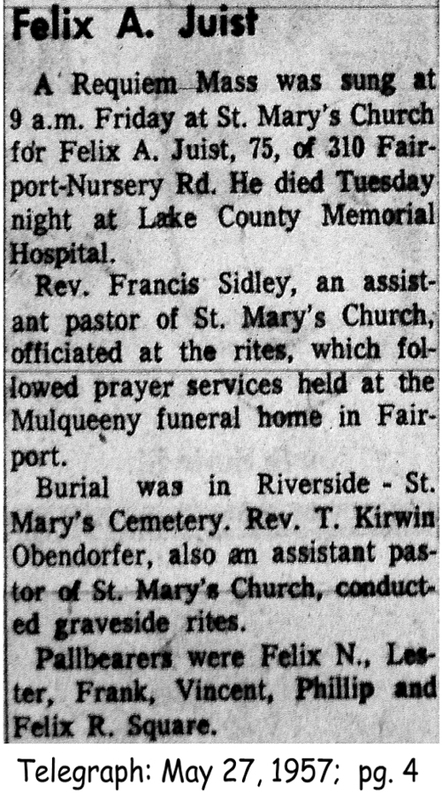 His body was interred at Riverside Cemetery at Painesville, Lake County, Ohio. Feliceantonio Giusti, age 23, immigrated to the United States on May 27, 1901, travelling to Providence, Providence County, Rhode Island. Feliceantonio Giusti established residence in Painesville, Ohio, in 1902. 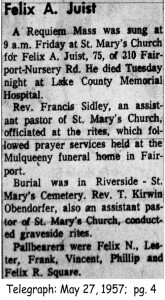 At the time of death, Feliceantonio resided at 310 Fairport-Nursery Road, Painesville Township, Lake County, Ohio. He was a retired nurseryman. He was employed by the Storr’s and Harrison’s Nursery for many years.